Death of a Dentist is the thirteenth book in M.C. Beaton's Hamish Macbeth detective series. In the town of Lochdubh in the Scottish Highlands, a local dentist is found sitting dead in his office with his teeth horrifically drilled into. Because the dentist was a womanizer, the suspects include several women he had an affair with, as well as a few dental patients. Hamish Macbeth must interview and investigate all the murder suspects before they catch on and kill Hamish. As always, Hamish uses his wits to solve the crime, but not without encountering quirky townspeople and several mishaps along the way. M.C. Beaton truly does write the best cozy mystery series. This particular book was humorous throughout and fun - definitely a stellar read. 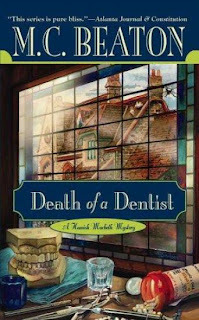 Following Death of a Dentist in this series are books 14 through 17, all of which are displayed below. Who are your favorite characters in the Hamish Macbeth series? Who is your favorite cozy mystery author? Share your thoughts with us in the comment section below.